“Loaded” might be an understatement. This season, the Metropolitan Division is the toughest it has ever been and is by far the toughest division in the league. As of Tuesday, the top four teams (Washington, Columbus, Pittsburgh, NY Rangers) in the Metro all have at least 57 points, which is the point total of the Pacific Division-leading Anaheim Ducks. Before Tuesday’s games, the same four teams have a combined +148 goal differential. That is not a misprint. So, what’s it going to take to win this tight, high-scoring, star-studded Metro division? Well, it might be the team who ends the season with the most consecutive victories. I’ve never seen so many teams go on these kinds of extensive winning streaks in the same year, and folks, we still have half of a season to go. The Minnesota Wild were winners of 12 consecutive games earlier this year before their streak was broken up by Columbus, who won game No. 15 in a row with that victory. But inside the Metropolitan Division alone, there have been some lengthy winning streaks. Columbus did not lose a single game in the month of December as part of their historic 16-game win streak but were never able to pull more than three points ahead of the second-place team in the division. Pittsburgh had a seven-game winning streak and Philadelphia had a ten-game winning streak happening at the same time. Both teams’ final wins of their respective streaks occurred on the same date, Dec. 14. The Washington Capitals just had their nine-game winning streak snapped on Monday night in a wild one vs Pittsburgh. Over that run, Washington shut out its opponents in four of those nine games and outscored them opponents 40-11. These winning streaks are a testament to the strength of the competition within the division. If four or five teams in the same division are capable of rattling off seven wins in a row at any time, that’s when you know that division is loaded. Even though they haven’t had a winning streak worth bragging about (yet), the New York Rangers are right there in the mix despite an extreme amount of man games lost. With 57 points, the Rangers sit five points behind the idle Capitals in fourth place in the Metropolitan division. 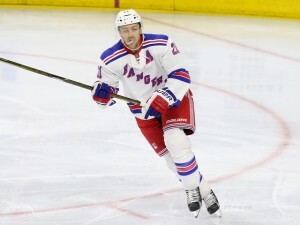 Without injured forwards Rick Nash and Mika Zibanejad, it would make sense if the Rangers slid in the standings. However, they’re getting consistent offensive outputs from Derek Stepan, Kevin Hayes, Mats Zuccarello, J.T. Miller, and Chris Kreider, who all have 30-plus points. Despite only eight assists, the speedy Michael Grabner is making huge impacts as he leads the team in both goals (19) and plus/minus (plus-22). Rookie Jimmy Vesey is proving to be a scoring threat with 11 goals and seven power-play points in his first year in the NHL. Defensively speaking, Marc Staal has been missed, but Ryan McDonagh is holding the fort down while also leading the team in assists (25) and power-play points (10). Nick Holden, who was acquired from Colorado last June, is also contributing on the scoresheet (23 points) and in the plus/minus department (plus-20). The leadership and depth of their organization has paid dividends and is the reason why the Rangers have played this well without some of their top players. Speaking of depth, that’s what you see out of the three teams ahead of the Rangers in the Metro. Obviously the Penguins have Sidney Crosby and Evgeni Malkin, the most dynamic duo of centers in the entire league. The Capitals have Alex Ovechkin and Nicklas Backstrom, whose chemistry as top-line forwards has produced many a goal over their years together. Even though those guys mentioned above are scoring almost every night, on nights when they don’t score, they need help from their other forward lines. And that’s exactly what they get. For the Penguins, it’s Phil Kessel, Carl Hagelin, Nick Bonino—the most productive line the entire 2016 Stanley Cup Playoffs—or it’s Patric Hornqvist or Conor Sheary. For the Capitals, it’s T.J. Oshie, Justin Williams, Evgeny Kuznetsov, Marcus Johansson, or maybe Jay Beagle providing the extra scoring. And don’t forget about the Blue Jackets. Columbus likes to roll all four lines and those four lines can score. Most of their offense comes from their top line of Brandon Saad, Nick Foligno, and Alexander Wennberg; however, their leading scorer, Cam Atkinson is on the second line. Third-line wingers Scott Hartnell and Josh Anderson have 11 and 10 goals, respectively. Fourth-line center Sam Gagner has 14 goals as part of a 30-point campaign so far. In addition to the offensive firepower of Washington, Columbus, and Pittsburgh, each team also possesses solid defensive depth including defensemen that can produce at both ends of the ice. Plus, all three teams have great goaltending – Washington and Columbus especially, given both teams’ goaltenders were selected to this year’s All-Star Game. Not to discredit the other teams in the Metropolitan division, but the top four teams in the division are arguably the best four teams in the entire league. If any two of these four teams are playing each other on national television, you would be wise to turn it to whatever channel they’re playing on. These four teams are going to battle it out the entire second half of the season to try to win the division. Whichever team does wear the crown of the Metro at the end of the regular season will have earned some serious bragging rights. Come playoff time, there are likely five teams from the Metro filling five of the eight total spots in the Eastern Conference. If so, two Metro teams will take both wild card spots. Assuming no Metropolitan team in the bottom four goes on a crazy run to end the year—and that might be a poor assumption to make given the happenings so far this season—one of the current top four teams in the division will be a wild card. What Atlantic Division team wants to play the Capitals, Jackets, Penguins, or Rangers in the first round of the playoffs? There should be no hands up.